I know weekend recaps haven’t been cool for a long time. But I don’t really care, cause I had a great weekend. – My friend Allie and I threw my cousin Erika a surprise party for her 30th birthday on Thursday. She’s never had a surprise party before, so she was pretty happy. – I forgot that I am a total lightweight when it comes to alcohol these days, and I ended up falling asleep on Erika’s couch around midnight. I probably shouldn’t have tried to keep pace with the boys and slammed all those Bud Lights. – Jeff felt left out, and needed to have his picture taken on Erika’s lap too. We ain’t ever growin’ up yo. – I made the three hour drive home on Friday. It was a bit rough given the festivities the night before. 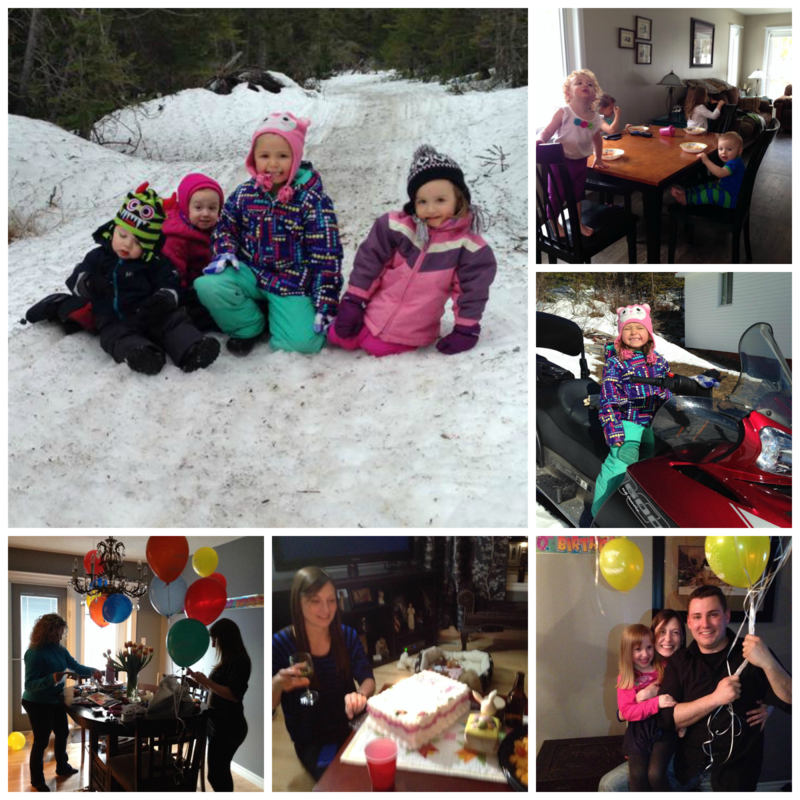 – My monsters were home from Alberta for Easter break. I got to spend Friday night and most Saturday playing with them and teaching miss Myia how to drive a snowmobile. – Sunday morning was spent being super lazy and watching HGTV with my momma. House Hunters, Leave it to Bryan, Property Virgins, we just can’t get enough of it. – Sadly I don’t get Easter Monday off work, so I had to drive back Sunday afternoon. I spent the evening catching up on some tv and making a few tweaks to this place. My Daily Reads page is back up and running. Its a lot less flashy, but at least it works again. Hope you all had an equally wonderful Easter weekend!